The Table of Less Valued Knights, by Marie Phillips – There have been many parodies of the King Arthur mythos, but this one covers some ground that I hadn’t seen before. It introduces another table at Camelot for the knights who aren’t good enough for the Round Table, or are in disgrace for some reason. Sir Humphrey du Val is one of the latter, but he sets out on a quest anyway, accompanied by his small giant squire who rides an elephant. He eventually crosses paths with Martha of Tuft, who has become queen after the death of her father, but unfortunately received an oafish husband along with the position. She runs off to find her lost brother, and is disguised as a man by a fill-in Lady of the Lake. Her husband Prince Edwin receives some development as well, going from just a lout to a more truly evil character, and delving into how he was constantly bullied by his even nastier older brother. There are a lot of jokes on the genre, some quite clever and others more or less old hat, but the plot is also pretty complex and the characters interesting. 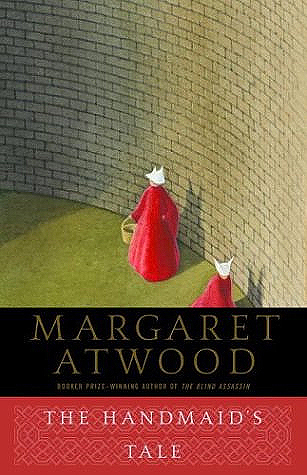 The Handmaid’s Tale, by Margaret Atwood – My friend Tavie recommended this, and it seems pretty timely these days. I saw a few pictures of signs from the Women’s March specifically referencing it. But then, stories like these are probably always going to be relevant, unfortunately. It’s a dystopian novel about a future America (well, since it was written in 1985, the time it’s likely set in has actually already passed, but still) that’s been turned into a fundamentalist Christian theocracy. Women have pretty much no rights at all, and are just used for breeding. The narrative is in first person by a woman working as a handmaid, which means she’s kept in a powerful man’s household for him to impregnate, with the name referencing the Biblical stories of Abraham and Jacob having children with handmaids. The protagonist occasionally flashes back to earlier days, when she was married to a man who’d been divorced, which had become illegal under the new laws. Her fate is never actually explained, but there is an epilogue taking place in the farther future, with academics trying to understand the historical content of the story. It’s satirical, but based on ideas that are all too real. While such things ebb and flow, our current president and his administration seem determined to roll back the individual rights of American citizens, women and minorities even more so than the rest. There was a lot of this sort of thing going on in the Reagan years as well, but I don’t think Ronnie ever bragged about sexual harassment. Starry River of the Sky and When the Sea Turned to Silver, by Grace Lin – These two follow up on Where the Mountain Meets the Moon (despite actually taking place before it), all three being based on classical Chinese mythology, with children as the main protagonists. The plot is frequently put on hold for a relevant story, and the illustrations are very appealing. The main character in Starry River is Rendi, the son of a cruel magistrate who’s run away to the Village of Clear Sky, where the Moon has disappeared from the sky. It’s bookended with the tale of how the village leader convinced a spirit to move the mountain that had originally been there, which turns out to be not entirely true. The village residents are all involved, and many have back stories that connect to the mythology, as well as more mundane problems that are settled over the course of the book. When the Sea is about an emperor who craves immortality, and goes to horrific lengths to achieve it. He kidnaps an old storyteller, and her granddaughter Pinmei sets out to find a magic stone to exchange for her, accompanied by a mysterious boy named Yishan. With some assistance from the Sea King, they find that the emperor has stolen an iron rod that makes him invincible, and captured the Black Tortoise of Winter. He’s commissioned a wall around the country to keep the Tortoise from escaping. He eventually does achieve immortality, but not in the way he expects. Both of these books have a lot of characters who pop in and out of the story, and based on what I’ve seen on Goodreads, I’m not alone in sometimes forgetting who they are. That’s a minor gripe, though; these books are definitely worth reading. This entry was posted in Art, Arthurian Legend, Book Reviews, British, Chinese, Christianity, Current Events, Feminism, Fundamentalism, Humor, Mythology, Politics, Religion and tagged grace lin, king arthur, lady of the lake, margaret atwood, marie phillips, starry river of the sky, the handmaid's tale, the table of less valued knights, theocracy, when the sea turned to silver, where the mountain meets the moon. Bookmark the permalink.